If Skittles started making creamsicle flavored Skittles, I think they would look like this. And you would so buy them. You'd feel guilty about it, and you would purposfully rip the bag right where the calorie content was listed, but you would still buy them. And you would LOVE THEM! I used six colors for this creation. My Boyfriend Scales Walls (OPI) for the white, Grape Pop (China Glaze) for the purple, No Room for the Blues (OPI) as my blue which turned into a beautiful softer blue, Just In Lime! (Sally Hansen Insta-Dri) for the lime green, The "It" Color (OPI) for my yellow (with no hint of the red undertones coming through at all) and Tasmanian Devil Made Me Do It (OPI) for the orange/red. Holy cow! I love them!!! omg creamsicle skittles would be awesome and this mani is a perfect depiction of what they would look like!! What a great idea--these are adorable! They're so bright and colourful and cheerful and man, now I really want some creamsicle Skittles. I would open them, put them in a bowl and throw the bag away so I wouldn't be tempted to put the pieces back together to check the calorie content. You should send it to skittles. I love it. I did water marble skittles a few weeks back too. I loved it! Skittle manis are fun. I love this mani! 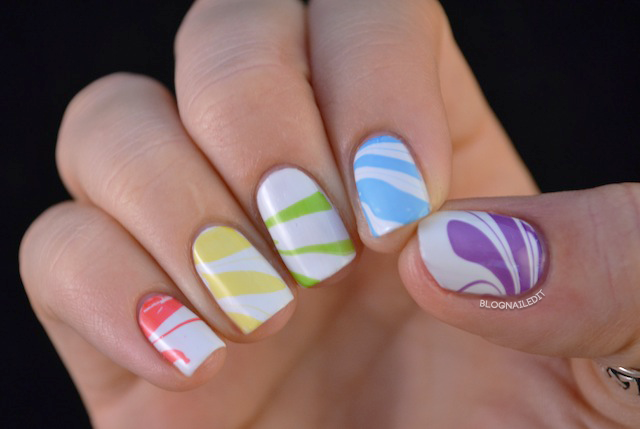 Watermarble and skittles? Perfect! Great idea!